Keith (WH7GG) :: Ham & Pineapple | A journey through the world of amateur radio. It’s time once again for that wonderful ham radio gathering known as Field Day, which takes place from 8:00 a.m. June 23, 2012 to 8:00 a.m. June 24. Hams from all over the U.S. and other countries will gather on the airwaves to try to make as many contacts with each other as possible. Although there are likely going to be numerous places from which hams will be operating, for hams on Oahu looking for lots of hams to meet and lots of activity, they’ll have some choices to make. For those who prefer a day at the beach, the Koolau Amateur Radio Club will be holding their annual Field Day celebration, as they’ve done in past years, at Kualoa Regional Park on the windward side. Both events will be open to the public and hams will be available to answer questions. Both clubs will also need people willing to camp out on Friday, June 22, to help setup antennas. Check each club’s website for more information. For an idea of what happens on Field Day, check out my YouTube video from last year’s combined EARC/KARC Field Day. CQ Ham Radio, this is Bytemarks Cafe! Burt Lum and Ryan Ozawa are both well-known among the technology community, and among geeks in general, here in Hawaii. Among other things, on Wednesday afternoons at 5:00 p.m. on 89.3 MHz (HPR-2), they can be heard on the Hawaii Public Radio talk show Bytemarks Cafe, which talks about all things tech. They’ve been doing it for several years now, so these guys do know their way around a radio station (or at least around a mic). Now, you might be hearing them on 146.88 MHz and other frequencies as well. Today, both Burt and Ryan passed their Technician class exams, and in a couple of weeks they’ll have callsigns of their own. That the ham radio community now has the two alpha geeks (and the best tech evangelists) in Hawaii speaks volumes. Listen to their show so you know their voices. Then keep an ear out for them on our bands, and give them a warm welcome! Update 6/10/12: One thing about Ryan – he also maintains a lot of Hawaii-related sites, tops among them his Hawaii Blog. In keeping with that, he’s started Hawaii Ham. Thanks, Ryan, for the shout-out. Perhaps you’ll be keeping things more up-to-date than I have been. It takes more than a big-gun station to make a top operator. I happened across this article this afternoon on the ARRL website. I found it rather timely given a rather regrettable affair between two fellow hams (whose calls I will not name – they know who they are) that should have been kept private, but was unfortunately aired in the rather public forum of the EARC e-mail reflector. The article is great reading, if rather sad. However, to make my point, I’ll cut to the chase (emphasis is mine). During my drive home later that night I tried to imagine why any ham would want to ruin the enjoyment of Amateur Radio by anyone else. The ego, selfishness or anger issues that I mulled over as the possible answer reflected so poorly on the other operator that I finally gave up and concluded that his behavior was simply beyond my comprehension. Ham radio is a hobby that should be fun for all participants regardless of their equipment or skill level. If those unwilling to play nicely with others succeed in driving people away, the eventual result will be a few big-gun stations that quickly work each other and then spend the rest of the contest weekend calling CQ endlessly without being answered because the operators who might have replied have quit the hobby. Every year, at the beginning of hurricane season, the emergency management agencies across the state participate in an annual exercise of emergency preparedness called Makani Pāhili (hurricane or cyclone in Hawaiian), testing the worst-case scenario – what if a category 4 or 5 hurricane made a direct hit on Oahu? Amateur radio operators play an important role in the exercise, and from 9 a.m. to 12 p.m. on June 2, 2012, hams are asked to participate in the communications exercise by formulating and passing simulated traffic on the ICS-213 form. State RACES coordinator Ron Hashiro, AH6RH, has more details on his website. Also on his site is more information on passing ICS-213 traffic. Participate, get involved, and be prepared – an emergency is not the time to be learning how to pass traffic. Since getting on HF, I’ve dabbled a bit in contesting. Not seriously, of course. There’s only so much I can do on 100 watts and with only a 20 meter antenna. But I try to work the stations I can by tuning up and down the band, and send in my Cabrillo file afterward to get credit. 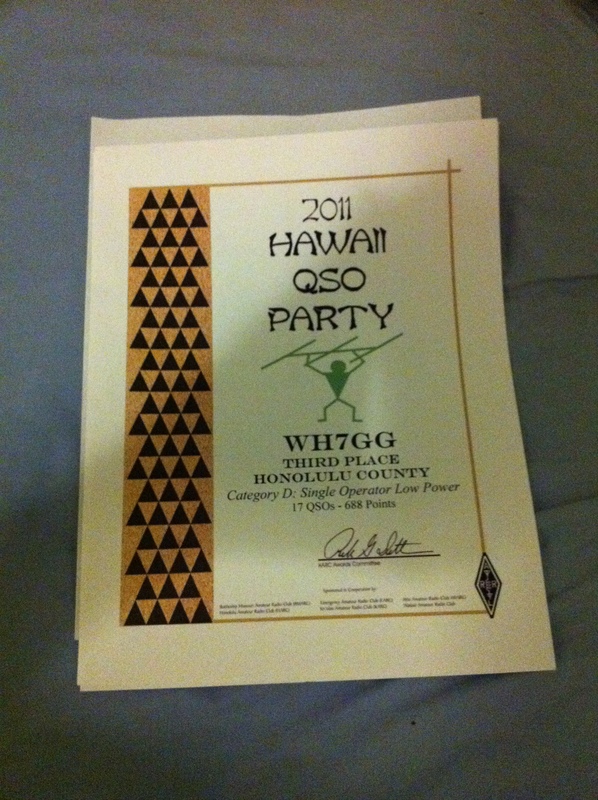 This past August was the first time I participated in the Hawaii QSO Party. That weekend on Saturday, I paid the QTH of Randy KH6IB a visit, where members of the Emergency Amateur Radio Club were hanging out for the next band opening. I got on the mic for a little while and worked a few stations for KH6CE, so I got credit as an operator. Then once conditions started improving, I headed back home, fired up fldigi, and got ready to work some stations that afternoon. As you probably know, I’m a big fan of PSK31, and have made most of my contacts that way. And the HQP is one of the relatively rare contests that not only allow PSK31, but actively encourage it by giving you triple the QSO points. Yep, third place in Honolulu County for single operator low power (less than 150 W). The first place op had around 17,000 points, and the second place op had 2,000 points. So I was about two orders of magnitude below them. Still, third place is third place. In a way, though, I’m kicking myself a bit about those four SSB contacts so I could get the multipliers for Kauai and Ford Island. Without them I would have lost just four QSO points and two multipliers, leaving me with 546 points. That still would have been the best performance on PSK31 statewide. D’oh! Still, I had a lot of fun at the HQP. Any contest that allows PSK gets a gold star in my book. 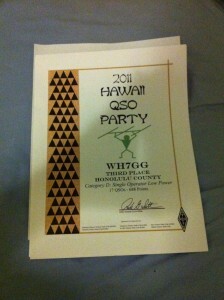 Next year at the Hawaii QSO Party, I think I’ll keep my big mouth shut and let my fingers do the talking. It’s hard to get there. There’s a very small airport, and the only other way in by land is a mule trail down sheer sea cliffs. Access to the peninsula, strictly controlled by the Hawaii Department of Health, is possible only via invitation, special arrangement, or by organized tour. It’s also one of the hardest places to reach by radio waves. But five amateur radio operators from Honolulu plan, for a weekend at least, to put Kalawao County on the map. Kalawao County, Hawaii, home to the former Hansen’s disease settlement on Kalaupapa, is one of the smallest counties in the United States, both by population and by land area – according to the 2010 census, only 90 people live on the 13 square miles on the northern tip of Molokai. There are only eleven patients left in the settlement and about 25 staff members living there as well. The small population also makes the county one of the most sought-after spots in the United States. Until very recently there were no hams in Kalawao County (two new Technicians passed their exam about a month ago), and there have been no hams capable of doing HF (shortwave) communications since the 1960s. Five amateur radio operators are now in Kalaupapa preparing to work other stations around the United States and abroad as part of the Hawaii QSO Party this weekend. (QSO is amateur radio speak for a two-way radio contact.) These operators are Joe Speroni (AH0A), Jim Yuen (WH6GS), Bev Yuen (AH6NF), Kimo Chun (KH7U), and Ron Hashiro (AH6RH). For more information on the Kalawao County DX-pedition, visit Ron Hashiro’s page. Then came his response back. Ummmm…OK, so you don’t care about my name or where I’m from. In fact, I’m not even a human to you. All I am to you is a call and a signal report. I got the message, loud and clear. I am always doing other stuff when on the radio (working on the side), unless when I’m contesting. That didn’t sit well with me. Of course, he does have the right to make contacts however he darn well pleases. And yes, during contests, DXpeditions, and such, brevity is key. The point of those is to make as many contacts as possible, bam bam bam bam bam. In the short time I’ve been on HF, I’ve worked contests before on voice and on PSK31, and know the drill. Exchange calls, signal reports (in a contest you’re always 59 to the other guy and vice versa), and your required other piece of info, and move on. Still, not all of ham radio is a contest. Not all situations call for a QSO stripped down to its bare essentials. Especially on HF, where you’ll run into hams from all walks of life and all countries and cultures of the world, it’s good to be open. And it is worth noting that there ARE humans on the other end. Truth be told, even on voice I have yet to master the art of the ragchew. In my case it’s more of a rag-nibble. I’ll exchange signal report, name, QTH, maybe weather, maybe talk about my rig, maybe another comment or two, but then I’ll let the other station go. I’m not very talkative in real life, and ham radio is no different. Still, when I’m working someone, he or she has my full attention, as it should be even in face-to-face conversation. And I’m polite as I can possibly be. After all, I understand that his impression of me is based how I conduct myself on the air. I often find that being from Hawaii and having a KH6-region call sign opens up a lot of conversation possibilities. On voice and PSK, I often find that saying I’m from Hawaii elicits fond memories of a visit here, or if not, a desire to do same. Similarly, say you’re from Oregon, and I’ll wax poetic about the natural beauty of the Northwest, my time at Lewis & Clark College, and my many trips since then. I really wonder what this guy is like in person. I wonder what sort of impression people get of him when they work him on the air. Sure, he must be a contester extraordinaire, with skills as polished as that. But it must be REALLY boring to have a conversation with him, if his ham persona outside contesting reflects real life. Does he have a life outside ham radio? I wonder, too. Portland, Oregon, has been my second hometown for many years. More recently, it’s become my favorite vacation spot. Even more so since there’s a Ham Radio Outlet located there. I bought both of my base station rigs there – my FT-7800 in 2007, and my FT-857D in July 2010, and whenever I’m in town I pay them a visit. Still, I find that, what with all the other things I do on vacation, sometimes I hardly touch the HT. Today is my last day in Portland for this trip, so I decided just to check out the bands on the HT. While scanning up and down the 2 meter band I happened across 146.70 (pl 100), and caught the tail end of a “YL net.” YL, in ham speak, means woman (“young lady”). I must have caught net control off guard since she asked for my call again. Maybe she was wondering why a 7 station is signing portable W7. I did get a nice warm welcome once I said that I was visiting from Hawaii. Anyway, it was nice to be able to use the radio on vacation. I really should make it a habit to use it more often when I’m out and about on the mainland. Maybe next trip. Most people are familiar with the phrase “to have a field day” in various contexts – in some cases meaning experiencing freedom from responsibility, in other contexts referring to criticism, but in all cases to appear to enjoy oneself doing it. However, when ham radio operators in the United States and Canada have a Field Day, it actually has a more specific meaning. It refers to the ARRL and RAC Field Day, held every year on the last full weekend of June (June 25 and 26 in 2011). On that day, thousands of amateur radio operators get out from their home locations (hence the name – getting out “into the field”), set up stations running on emergency power, and operate for a 24 hour period. In its basic form it’s an emergency communication exercise – you never know where you’ll be setup in a communications emergency; you probably will not have commercial power readily available; and you want to be able to operate for as long as possible with the equipment you have. But while Field Day serves an important role in preparation for emergencies, hams have a whole lot of fun as well. Here are some clips of the last Field Day the Emergency Amateur Radio Club had with their sister club, the Koolau Amateur Radio Club.